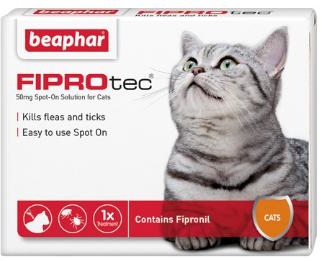 Beaphar FIPROtec® Flea treament is a veterinary strength spot on medicine to kill fleas and ticks on cats and dogs. 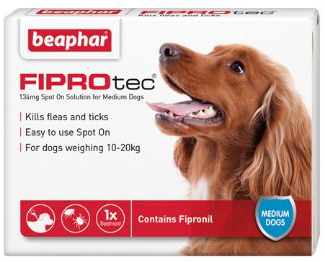 Containing the well known active ingredient ‘Fipronil’, it is an easy to use, effective and very affordable flea and tick treatment. 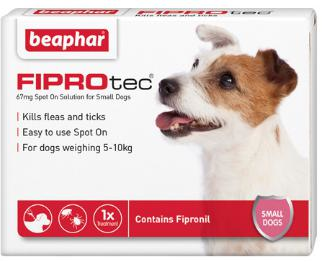 The Fiprotec active ingredient is Fipronil which is the same active ingredient used by vets (i.e Frontline). Fleas are blood-sucking parasites that can make life miserable for pets and their owners. 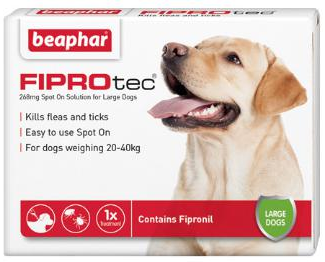 Fleas can cause; intense itching and scratching which can result in hair loss and skin wounds, flea allergy dermatitis – an unpleasant skin condition caused by an allergy to flea saliva, tapeworm infestation – one type of tapeworm is transmitted by fleas, and anaemia in puppies. 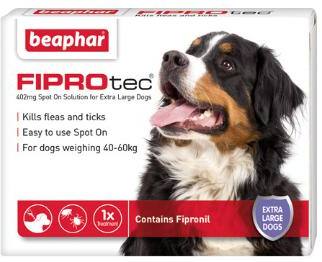 The number visible on your pet is just the tip of the iceberg, since only 5% of fleas live on the animal. The other 95% are in your home and are mostly invisible, either because they are very small or because they keep out of direct light. It is essential to treat both your pet and your home on a regular basis. Fleas can transmit tapeworms. Worm your pet after a flea infestation.